In discussions with fellow genealogists on Facebook, I have been asked several times to share how I use Evernote as a Research Log and since I just had a major research trip in which I used Evernote as my Research Log and made tremendous research progress, I thought sharing via my blog would be easier and allow more people to see the process! Step One: Let me get some acronyms out of the way so that we are all on the same page. Notice that I tagged the Note: “!Online at Family Search”? This is to let me know this deed book is online and I didn’t need to look at it at the archives. This saves me on site research time, when I remember to filter for it, that can be done at home in my Pajamas. But we are going to use this note anyway just so you can see what the process looks like. So now we have a list of people I am researching that had deeds on this roll of microfilm which covered Deed Books B and C. I did this for every deed book in Logan County, abstracting everyone with the surnames Elliott, Bryant, Briant and Thurmond. This took me about 3 hours to do for these 3 surnames both Grantor and Grantee. 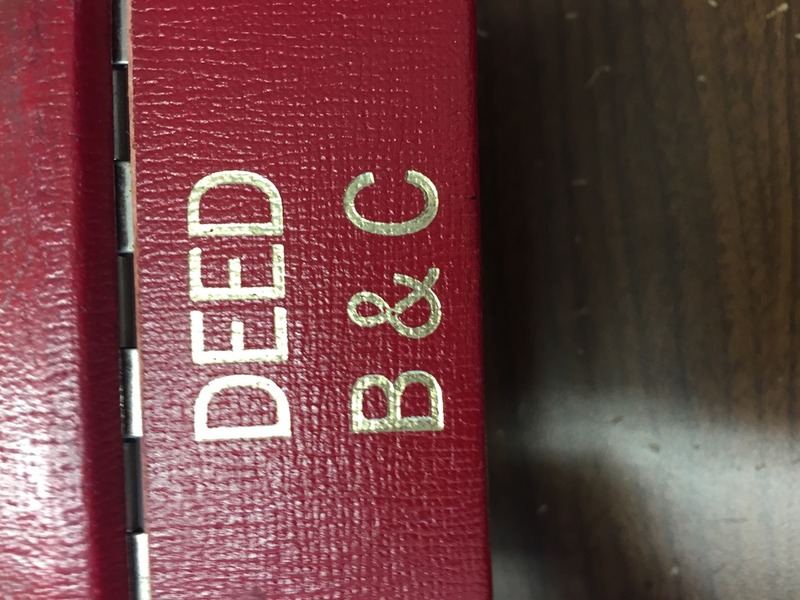 And Logan County had 78 Deed Books listed! There were many more that were in higher deed books, but since my family lines weren’t in those anyway, I won’t bother you with them for now. The deed in Book B, Page 571 is the one of interest for the rest of our blog. Step Three: Make sure you have synced Evernote! I use EN on both my phone and my Kindle and Hubby uses it on his phone, so a good sync of all devises is important while we are on Wifi. I have 11,000 EN notes! I want to be on Wifi. Now we were ready to travel to Logan County. We travel pretty light. I take my laptop and Kindle, clothes, snake shoes, bug spray, toiletries and a few snacks. I back up my computer before I leave and we are good to go. So if I need any information about my family, I have my genealogy data in TMG. But if I need my research log, its in EN and that is now on my iphone! 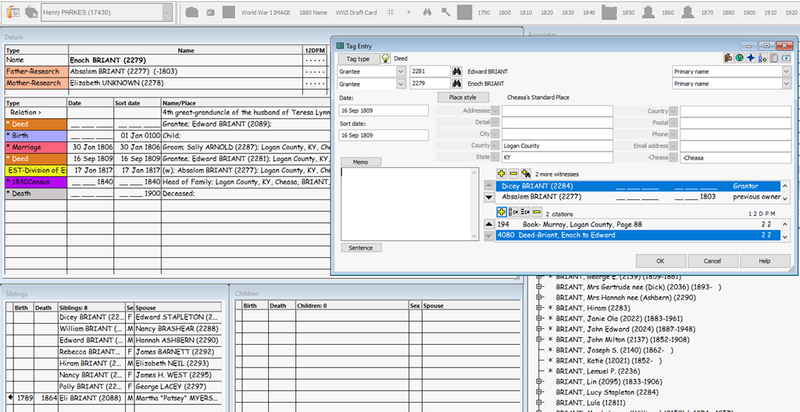 Step Four: At the Court House, I set up my laptop with EN open and filtered for “Logan County KY Microfilm” and !Not Online at Family Search” These are the books I need to get copies of while I am at the court house. Every courthouse and archive is different. Some let you use iphones, some require you to make copies, some will scan them for you. When I can use my iphone, I use it. I just hold my phone up and make a High Definition image. I know some people prefer scanning apps. They just slow me down and I am more about the document than I am a perfect scan anyway. Your mileage may vary. The apps are usually free, so test run them at home. I always take a picture of the outside of the Deed Book or the Cover page of a Book when making copies. For one thing, digital images are free and for another, it may be years before I get around to citing all the goodies I found this weekend. The cover page will have information you will need in your source citations. You can delete this image once you have cited the source in EN and added it to your genealogy program. But for now, I am going to need it to remember where this deed came from. So my next step is to create a Research Note in EN for this deed. I prefer to prefix all my research notes with the Document Type (Will, Deed, Marriage) so that they all sort together in the document list. You may have some other method of dealing with sorting issues. But since I file and sort by Document Type, I prefer that to come first. Because this document is a Bryant Document, it goes into the Briant Document Notebook in EN. (Note this family interchangeably uses Bryant and Briant, so I probably will as well. It is the same family regardless). I have one for each Surname. You only get 250 note books, but come on Genealogists, that’s a lot of surnames to be researching and after 30 years, I haven’t used all mine yet, so I think you are good for now. If we genealogists start running out, we can always let Evernote know we want more and see if they listen. Images on my phone are around 2.5 MBs. I don’t worry about shrinking them. I can have 100 MBs in an EN note, so unless I am going to have a 50 page Deed, I am not too worried about the size of the images. Hard Drive space is cheap and I have Evernote premium, so I have never reached my upload limit. After I have added my Deed Book Image and the image from the actual deed to my note, I make two 1×1 tables in my EN note at the top of the page. The first table is going to hold my citation (created in TMG) and the second will hold the transcription (which will be added to TMG). Note, the deeds I was using were in bound volumes so the images are going to show that roundedness. This doesn’t bother me as long as I can read the document. If it bothers you, speak to someone at the courthouse before you scan or take pictures. 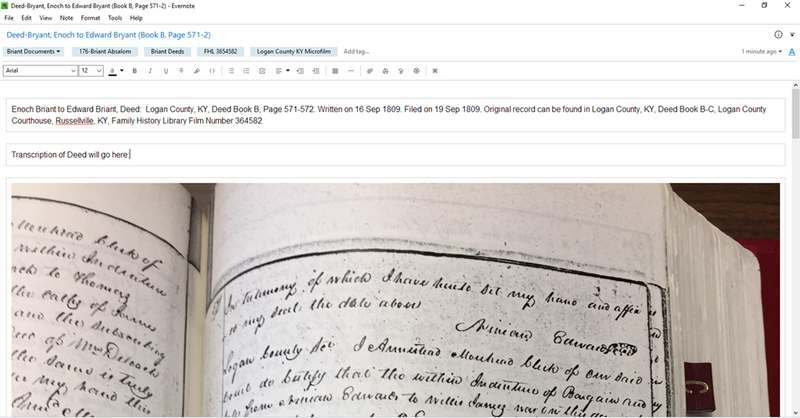 Deed Research Note showing partial image of deed book and deed page. The note itself is almost 7MBs and doesn’t all show on one page. But you can scroll to see both pages of the document. Notice that I have tagged this document with “Briant Deeds.” Enoch and Edward Briant are siblings to my husband’s 4th great grandfather. I am interested in their deeds to place them in the family information, but they are not his direct ancestors. Had one of them been his direct ancestor, I would have tagged this note with his tag as well to keep all his documents together via his Ancestor tag, but these are not direct ancestor deeds. I did tag it later with his ancestor Absalom Briant, because he is mentioned in the deed as deceased. 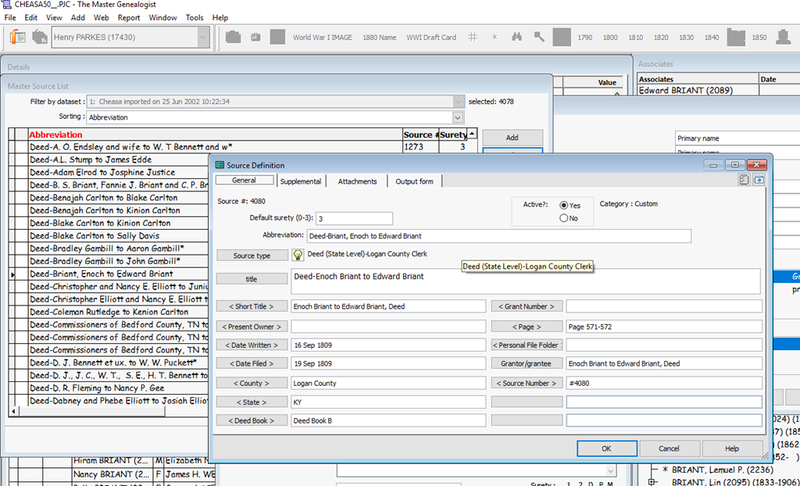 Step Five: Go to your genealogy program, and create an event for this deed, and a source citation. Event in TMG showing the event with source citation and also the person screen for Enoch Briant. 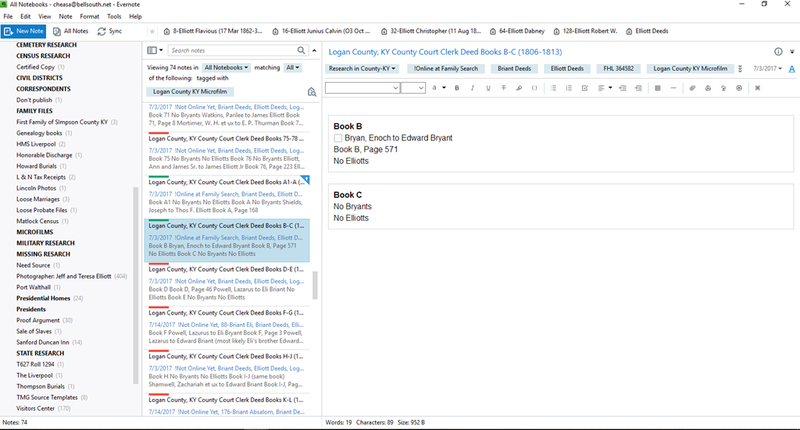 Source Citation screen in TMG showing source information as entered in TMG. Step Six: Add citation and transcription to your Note in EN. I did not transcribe this deed since I wanted you to be able to see the deed as part of this note. And to save time for getting blog post ready. You can see the first table now contains the source citation. Your citation may look very different than mine. That is fine. Ask yourself, can my reader find this document again? If they can, then don’t worry so much about form. Unless of course you are writing to be published in a Professional Journal. Then you need to learn their form and follow it exactly. I write for me and my cousins. We ain’t that picky. Step Seven: Go back to Research Note for you Deed Book and mark the task done. I also highlight the finished task just so it stands out more and I find it really easy to unmark those little boxes, but harder to unhighlight text. 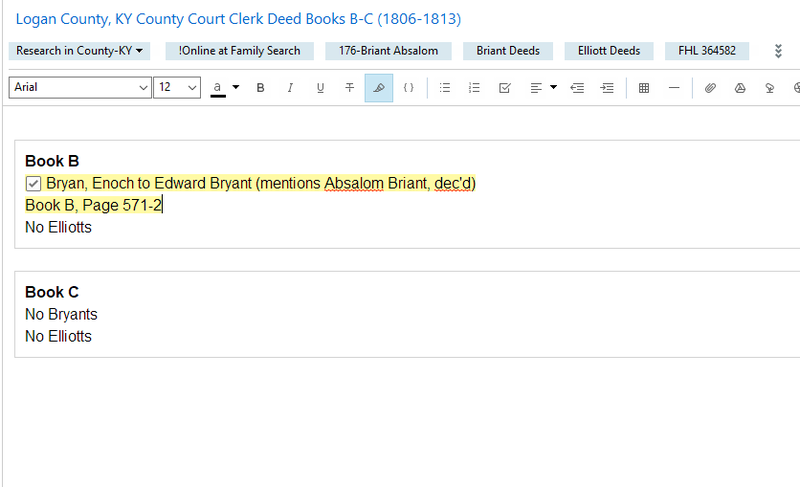 I also added Absalom Briant to the tag list, since he is a direct ancestor and because he is mentioned in this deed. This way this Research Note will show up on his list when I select his tag. Next Post Do You Ever Wonder? I’m such a beginner! Thank you for sharing these examples of genealogy research with Evernote. I have a lot to learn, this is helpful. So glad it helped! 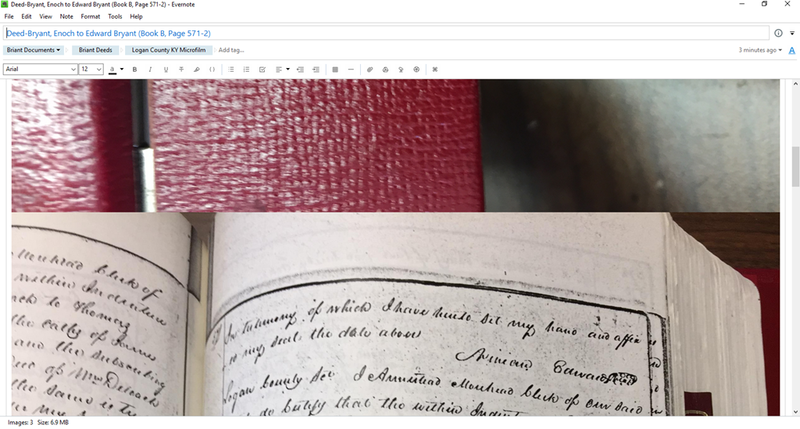 Its a work in progress but came in very handy at the State Archives!